Last week I travelled to Nunavut, Canada (just across the Manitoba border), to chase caribou. I hunted the same camp in 2015, but was unable to connect. In 2016 I had a New Mexico Elk Hunt, so I did not go back that year, but I wanted to give it another try. It is my understanding that the caribou hunts in 2016 did not go well at all. 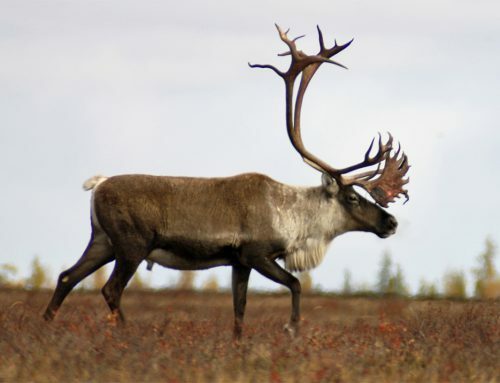 The caribou stayed north too long and waited to do their migration south until after the hunting season. For 2017, Webber’s Lodges (the outfitter) made a plan to adapt. 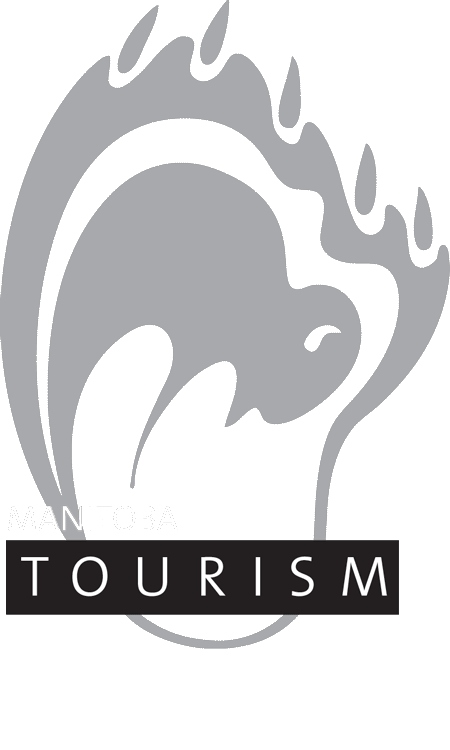 They would scout the Caribou herd’s location and if need be set up a mobile camp. This seemed like a great plan so I booked for 2017, but in the end it was unnecessary, as we had plenty of animals to hunt. On the flight in I saw four caribou near camp before landing. You have to wait 12 hours after flying in before you can legally hunt in Nunavut, so I spent the first day doing the normal things, getting settled in our wall tent, shooting my bow, and glassing for caribou behind camp. It was easy finding caribou, so I couldn’t have been more excited going into the first day. This is a 2-to-1 guided hunt and I was paired up with an older gentleman named Richard, who was rifle hunting. I hope that when I’m 81 I can still get around go on outings like this man. Richard was a very interesting person. He started his company in 1965 and still runs it today. Wow, think about that for a minute. It didn’t take long for us to find some nice bulls to go after on the first day. I almost got a shot on one after he crossed the lake, but was about 30 seconds late getting into a position. We moved to a couple of different locations stalking caribou and by 11:30 a.m. Richard had put a 306-yard shot on a bull. We took care of his bull and took a break for lunch. After lunch we found some more caribou and I was set up 300 yards away waiting for them to walk toward me for a shot. Suddenly a huge storm blew in and Johnny our guide wanted to take us back to camp. By the time we got back to camp the rain had stopped. I got on some drier clothes and Johnny and I went back out. Richard stayed back at camp, having already tagged one for the day (he had 2 tags). Johnny and I set out for a different part of the lake and there were caribou everywhere. 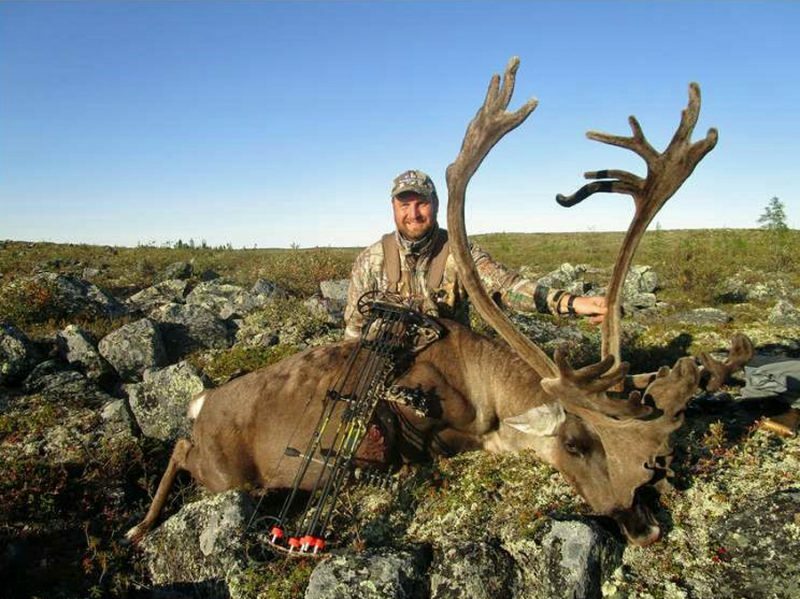 Seeing caribou at 200-400 yards is one thing, closing the gap to bow range is quite another! Eventually we ran out of time and headed back to camp. What a first day! On day two we made a plan to return to where the caribou had crossed the lake that first morning. We made a stop along the way to attempt a stalk on a nice bull, but that just didn’t pan out. We made it over to the crossing and after getting into position I looked across the lake and saw a group of six bulls. Richard and Johnny set up for a rifle shot and I was set up for bow. After only 20-30 minutes they began to pile into the lake one by one crossing toward me. As is often the case, the last bull was the biggest. Unfortunately they seemed to sense something was up and deviated from their route just enough so that I was unable to get into position in time to get a shot. Richard was not able to get a shot either. In fact, from where they set up I don’t think they saw the caribou. This seemed like a good spot to sit for a while to get a bow shot, so Richard and Johnny went back to the boat to take a break. They were going to go elsewhere while I stayed back to wait for more caribou to cross. Richard and Johnny were not too far away from me, maybe 300 yards, but I could not see them. After about 30-40 minutes I heard a gunshot. Turns out, despite the boat being visible, a group of bulls had decided to cross the lake near Johnny and Richard. Richard made a 40 yard shot to kill his second bull while eating lunch! 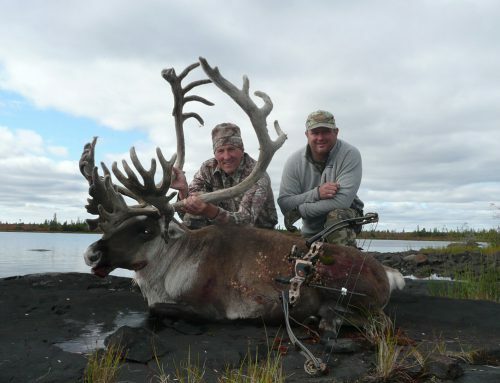 After taking care of Richard’s second bull we took him back to camp and dropped off his caribou. 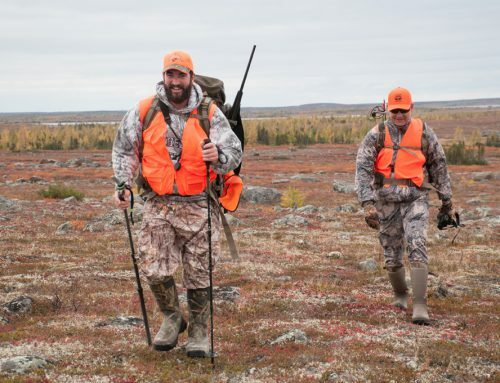 Johnny and I continued to hunt, but we were having difficulty getting into bow range on some very open tundra. On the third day at breakfast Richard told me he was going to tag along, even though he was tagged out. Instead of driving around looking for caribou we tried to set up and wait for them to walk our way. On one set up I was about 200 yards ahead of Johnny and Richard. After waiting about 45 minutes I saw antlers over the horizon moving toward me. Unfortunately the shooter bull walked past me at 81 yards, too far for me. The bull continued and walked straight toward Richard and came within 15 yards, presenting a perfect broadside shot! Richard was able to get out his camera and take a picture. We went back to the boat and had lunch and took a little break. After a while Richard spotted three nice bulls across the lake bedded in the open. After finishing our break we re-positioned to make a stalk. Like all my other stalks so far, I came close, but not close enough. When a caribou first sees you, they will often stand and look, even move closer toward you. This makes them particularly vulnerable to being shot by a rifle. But they seem to have about a 100 yard comfort zone. If they smell you at any distance they run away! After my failed stalk we moved and set up another ambush point. I ended up seeing caribou in the opposite direction, but the cross wind was in my favor. Unfortunately I was spotted and it turned out to be another failed stalk, just one of many! It was starting to get later in the day so I told Johnny we should head back toward camp and see if we could find some caribou along the way to hunt. As we were driving the boat we saw a group of bulls heading in the same direction as us. We continued past them and parked in the same spot we had been earlier in the day. I set out on foot to find a position to hide and ambush. To get the wind in my favor I had to move into the opposite side of a valley through what I would describe as a boulder field. As I was hopping along over and on these boulders/rocks looking for a place to set up, I noticed that there were two bulls to the right. The wind was perfect to move toward them, but I wouldn’t call the boulder field the best terrain for stalking. I was already exposed in the open, but they hadn’t noticed me yet. I figured they would probably spook as I got closer, but if they did I would go back to Plan A and wait for the other caribou. One of the bulls had his head down and all I could see was the tops of his antlers. He seemed to be feeding or perhaps raking his antlers in the bushes. There was another bull laying down who was not quite as concealed. As I approached them I started to get the feeling that this might actually work. 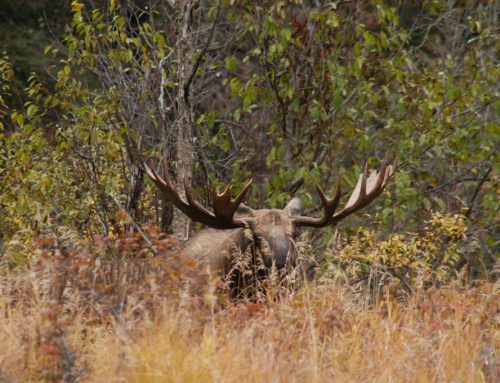 I used some of the vegetation near the more concealed bull to hide myself as I moved toward them. I was getting closer and closer. I ranged the bull’s antlers that were sticking up, 150 yards, then 100 yards, then 71 yards. Finally the less exposed bull stood up and looked right at me. I stood still and waited for him to move off. The other bull was still distracted and all I could see were the tops of his antlers. I moved closer to where I felt it was about 60 yards, the farthest I feel comfortable shooting and drew my bow back. I held at full draw for a minute, trying to decide whether or not I had a clear shot at his vitals. I realized later he was lying down, but at that moment I thought he was standing. I decided I didn’t have a clear shot so I let off. I waited about 30 seconds and he began to stand up. As he stood up I drew my bow back again and the bull took about two steps forward, clearing any obstructions and turned his head to look at me. At that moment I put my bottom pin behind is shoulder and released the arrow. I heard a thump, then the clink of my arrow hitting some rocks. The bull began to cough, walked about 20 yards, and fell over. I couldn’t believe it! It was just me and this magnificent creature. I could tell he had expired, but before I approached him to put my hands on him I took a moment to kneel and say some prayers. I thanked God and this incredible gift, and I thanked the animal for his life. This caribou hunt typically involve getting two tags, but the deal I had made for this hunt only included one tag with an option to buy a second tag later. I didn’t even ask about a second tag, my bull was perfect so no need to keep hunting. I spent the last two days hanging out in camp and practiced shooting my bow. By the fourth day everyone else (four rifle hunters, and one other bow hunter) had tagged out with two bulls each. The other guys in camp were great people and we had lots of laughs. All in all it was an outstanding trip!